We did a month-long self-driving trip to New Zealand to explore all the major wine regions. We started from South Island and work our way up north. Central Otago was our first wine region. We used Queenstown, Cromwell and Wanaka as our base while visiting Central Otago. Below shows our 5-day itinerary. Day 1 Central Otago Wine Trip – Day Trip To Gibbston Valley. Full blog post on day 1, click here to read more. To read the full details of day 2 itinerary & the wineries visited, click here to read more. Click here to read about day 3 in details. Click here to read the full post on our day 4 trip to Domaine Thomson – a biodynamic vineyard. Click here to read the full post about Wanaka, Rippon Winery and Cardrona. Click here for the Mount Cook post. Want to Learn more about Central Otago Wine? Central Otago is one of New Zealand most scenic wine region located in the south island of New Zealand, near Queenstown. It is also world southernmost wine producing region. 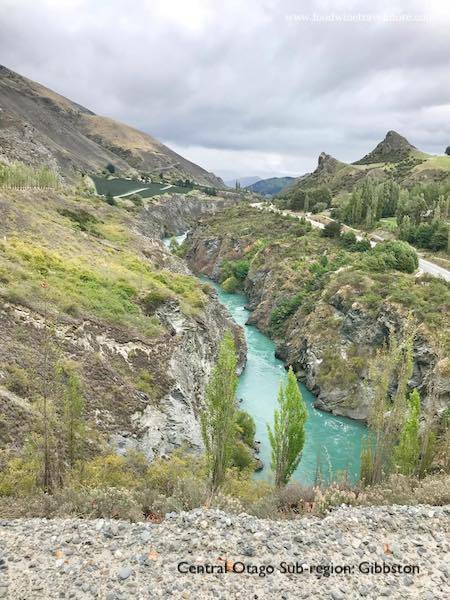 We spent 3 nights in Queenstown and drove to Gibbston for a day trip, and then spent a night in Cromwell, and another 2 nights in Wanaka to explore the nearby subregions. Approximately 30 minutes drive from Queenstown. Cooler climate and grapes ripen later than the other sub-regions. Gibbston Wine Style: lighter but still intense. Wineries in Bannockburn: Akarua, Bald Hills, Bannock Brae, Carrick, Ceres, Desert Heart, Domaine Road, Felton Road, Gate 20 Two, George Town, Mt Difficulty, Terra Sancta, Wild Earth. The old town was flooded under Lake Dunstan in the 1990s to construct the Clyde Dam. Some of the historic buildings dating back to the gold rush of the 1860’s were rebuilt on higher ground, creating the Cromwell Heritage Precinct (one of the must-visit attraction in Cromwell). Today Cromwell town is a busy service centre with farming, stone fruit and grape growing area. Most plantings in Pisa are situated on the lower terraces and valley floor running parallel to the snow-capped Pisa mountain range. Vines planted on gentle north facing slopes. Stony soils, extreme climates of hot summer sun and cold clear nights. Climate: dry and relatively cool. Extreme weather in both summer and winter. High daily diurnal temperature shift. Disclaimer: This post has no intention to promote drink driving. Please note that driving in Central Otago can be dangerous if you are not familiar with the local road. If you plan to self-drive to Central Otago for wine tasting, please make sure you have a designated driver who doesn’t drink. For our case (2 of us), we shared one tasting and the driver has to spit (can’t swallow) during the whole tasting! Please drive responsibly for yourself and the other road users. This post is written for readers to better understanding Central Otago wines and serves as a guide for wineries to visit. Central Otago is regarded as one of the top 3 regions in the world for Pinot Noir along with Burgundy in France and Oregon in the USA. Which Are Your Favourite Wineries? Have you been to any of the wineries in Central Otago? Which are your favourite wineries in Central Otago? I thoroughly enjoyed reading your posts about the Central Otago self drive wine tour; it is interesting that we and 2 other couples are planning a similar trip in November 2019 (we get out of Melbourne for the crazy Melbourne Cup week and head to some wine district for 3 to 5 days). This year we tossed a coin for Central Otago over Hawkes Bay. I had identified almost the same wineries although I did have Wooing Tree in my sights. Anyway to the point of my comment – the only matter that I found a tad confusing was where you stayed over night on Day 3; was it Cromwell, back to Queenstown, on to Wanaka or somewhere else? Apologies if it is mentioned and I could not see it. Keep up the great work! Thanks so much for your kind comment, Gary. Sorry for the confusing info. Haha. Yes day 3 we were still staying at the vineyard airbnb in Cromwell. We had a very good experience staying in different Airbnb’s throughout our trip in NZ. Highly recommended. Day 4 then we continue to drive to Wanaka.